Puerto Galera is situated in the North of Mindoro Island. Faced to Batangas strait, Puerto Galera is the nearest tourist destination from the capital, Manila. It makes that Puerto Galera has a interesting ambient and enjoyable night life all year round. Music festivals and sailing regatas are marked in the events calendar of Puerto Galera. Hundreds of diving spots make Puerto Galera a Top10 diving destination in South East Asia. More than 50 Diving centers are stablished in Puerto Galera. The entusiahsts of recreational navigation find in Puerto Galera the place to start an excursion to the Philippine seas. There are several boats available for rent during the year. Puerto Galera enjoys a great temperature all year round. The driest months are between December and April. August is the most rainy month. The Manila International Airport (NAIA) is the nearest airport from Puerto Galera. This airport operates daily flights connecting Manila with the major destinations in Asia and other parts of the world. There are several companies conecting Puerto Galera with Batangas during the daily hours. The service takes about 50 minutes dependig on the weather conditions. The trip from Batangas to Manila can be done by bus or taxi. The trip takes 2 hours depending on traffic. About 80 diferent accomodations are available in Puerto Galera. Visit the booking website to get prices and availability for your dates. The following boats are available for chartering in Puerto Galera. 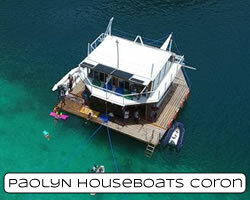 Contact the owner/operator of the boat for more details. Do not hesitate to contact us if you want to add your boat to this website to promote your yacht charter company or to make some money with your private owned boat.